Business map software will typically support optimized routing services for traveling salespeople. An optimized route service means the vehicle routes generated provide the option to travel via the most efficient route, instead of a route based on the stop-off order as presented by the imported data. Traveling salespeople use Map Business Online for a variety of functions including customer visualization, sales territory mapping and sales planning. Some sales people even use Map Business Online as a low budget CRM. in this blog we’re focused on vehicle routing. Map Business Online offers an optimized route option that considers speed limits, turn restrictions, one/two-way roads, road classifications and some traffic history. This means Map Business Online routing lets the user choose between a route based on the order of stop-offs in their data or a route based on optimization. The user can also choose to route one-way or with a return trip (two-ways). There are several things you’ll need when planning a trip using Map Business Online. Read about the routing process. Be sure to include other pertinent information, helpful to your field service world like sales history, lat/lon location of equipment, or even a contact’s birthday. Use that extra data to color shade and symbolize your imported stop-offs. Next, develop a list of alternative stops, to be used in the event of an appointment cancellation. Compile this data with the same addressing format as your customer stop-off list. You can combine the two lists if you like or import them separately. If you choose to combine include a column for customer type – to differentiate by symbol and color, real customers from potential customers or prospects. Users can color code their customer types after import using the various symbolization tools in Map Business Online. I speak from experience. I once turned a road trip cancellation into the biggest product order in company history simply by calling on a fall back prospect we’d never contacted before. It was a true cold call. I knocked on a door without an appointment and got to sit with a frustrated buyer, ready to talk about alternatives. You just never know. With your route data imported, you can route incrementally (one stop at a time), use a polygon or radius map object to develop a route, or route to all records in the Data Window view. With your route generated your able to adjust stops as required. Delete a stop. Move a stop up or down in the route order. Read more on routing. In the Data Window use the Add all Rows from the Data Window to a Route. This takes your data window view and automatically sets it up in the Route Window for route generation. Use a polygon (or other map object creation tools) tool to lasso a bunch of points. Save that list and then hit the Add all Rows… button again as in the above example. Route incrementally. Click a point on the map and the label pops up. Click the little Green Car Icon. Choose that address as a Start, Stop or Finish point in your route. The Route Window will open.Repeat until done. Then click the Route Window Car to generate your route. For expense reporting it’s important to track mileage, and perhaps even your time. Map Business Online route generation notes the total miles per route and total time for that route experience. It’s based, in part, on the travel times you import so make sure to use the time window options in Map Business Online if your accounting department requires it. Additionally, time durations per stop may be of value for managing your day activity and keeping your route schedule reasonable. The route function in Map Business Online also includes a few print options. You can print turn-by-turn directions or just a list of stop offs. Use Map Business Online print options in the Route Window for expense submittals or to generate detailed directions. Because Map business Online only allows one route to be generated at a time, use the various route save options to archive or share route information. Printed map views can include a created route. Four buttons in from the left on the Master Toolbar is the MapShare button. MapShare is where your map (with route included) will be saved and shared publicly with your constituents. They will receive an email with the MapShare link embedded. Your constituents, at no charge, may open that link, launch Map Business Online and use that map interactively. They’ll be able to pan and zoom all over the world, adjust the route, or create a new route from scratch, stop-by-stop. The route Window provides a Route File save option for easy sharing of Map Business Online route files with constituents. Route files support GPX, CSV, XLS, as well as Garmin and TomTom PND files. For critical business routes, that you may repeat in the future, save that map with the route included. 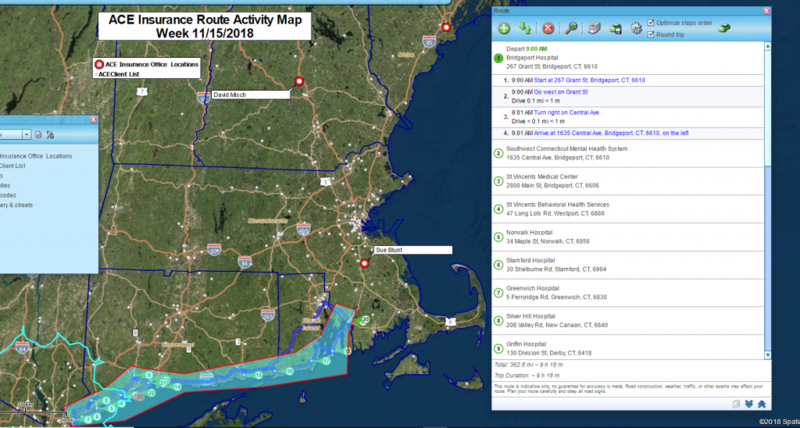 Remember MapShare options allow you to share interactive maps with routing. You’re map viewers have route editing capabilities included at no charge. This entry was posted in Business Mapping Software blog post and tagged business map software, MapPoint, sales territory map, Traveling Salesperson. Bookmark the permalink.